Some of my favorite light can be found at a Hotel Monaco Philadelphia wedding, especially in one of the corner suites! If you need even more room that that, I highly recommend the Majestic Suite and the Majestic Parlor! The Majestic Suite boasts amazing views of Independence Historic National Park. The corner one-bedroom suites and the Majestic Parlor have even better views of Independence Historic National Park, because there are two walls of windows instead of just one. 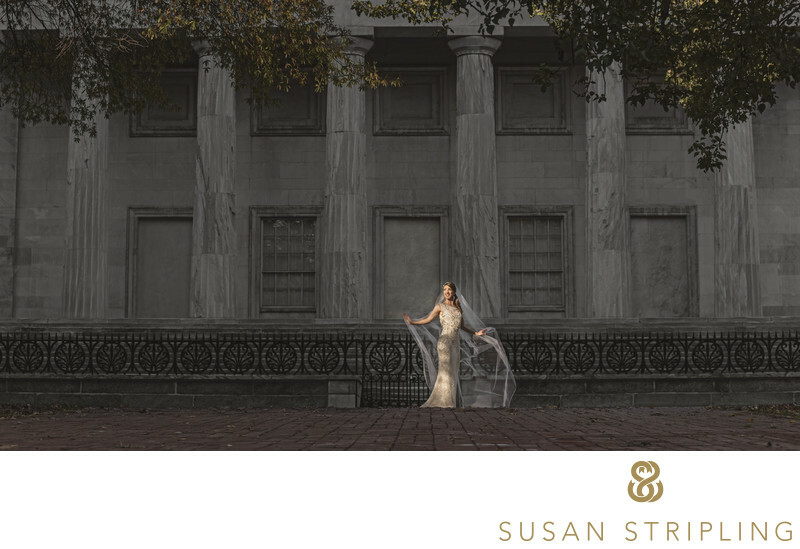 What does this matter when it comes to wedding photography? What does this have to do with wedding pictures at all? First of all, if you have your wedding party getting ready with you, more room does help! There would be more space to set up hair and makeup. There would be more room to hang dresses and sort through accessories. More room equals more breathing space, something that is almost always in short supply on wedding days! 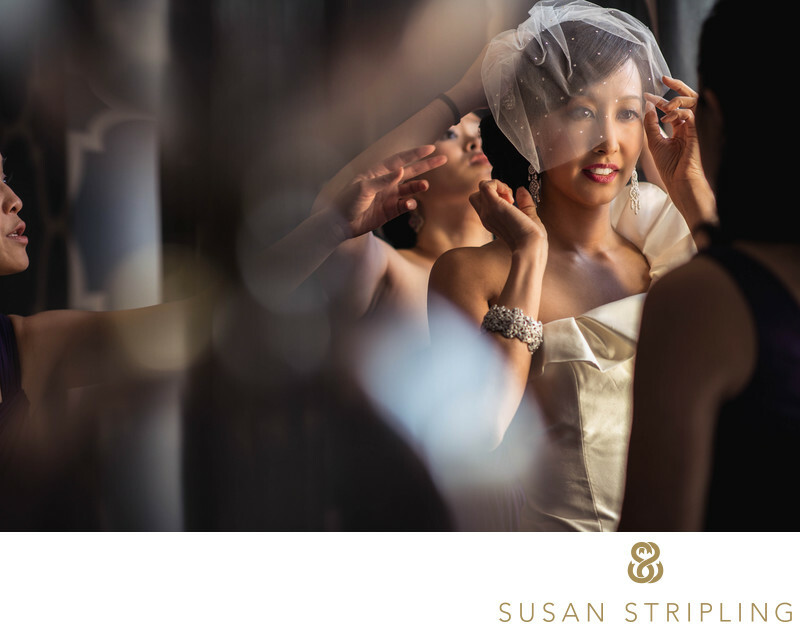 The room you choose to get ready in also matters when it comes to lighting that portion of your wedding day. 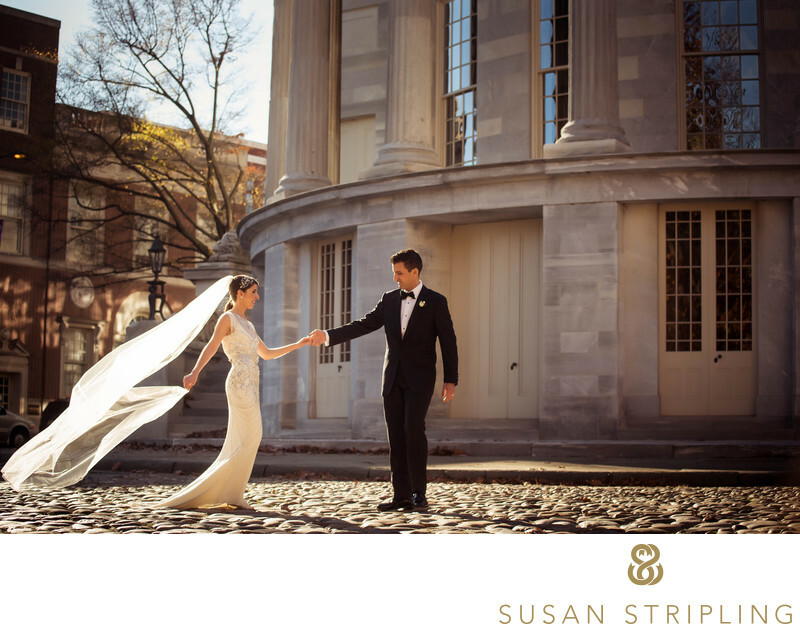 At a Hotel Monaco Philadelphia Wedding, should you chose one of those corner rooms, you’re already setting yourself up for success. And why is that? When your wedding photographer can manipulate the light in the room from different directions by opening and closing the curtains, they can change the way the scene is lit. 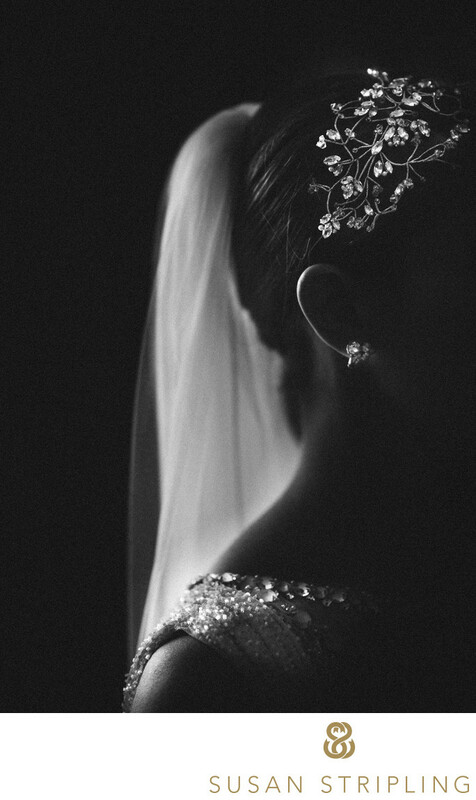 In this detail image of a bride’s gorgeous Jenny Packham headpiece, delicate veil, and Jenny Packham gown, I used the light from just one window. The other windows were closed, and the curtains were shut tight. This provided the perfect amount of illumination and direction to the light. If I had all of the curtains open and the room were flooded with light, this image would look quite differently. If you are trying to decide where to get ready on your wedding day, consider the lighting in your room. Many venues will offer up conference rooms, thinking that couples would rather have the biggest rooms possible. Usually the lighting in those conference rooms leaves a lot to be desired! If you decide to have your hair and makeup done in a conference room, consider moving into your hotel suite when it comes time to get ready. 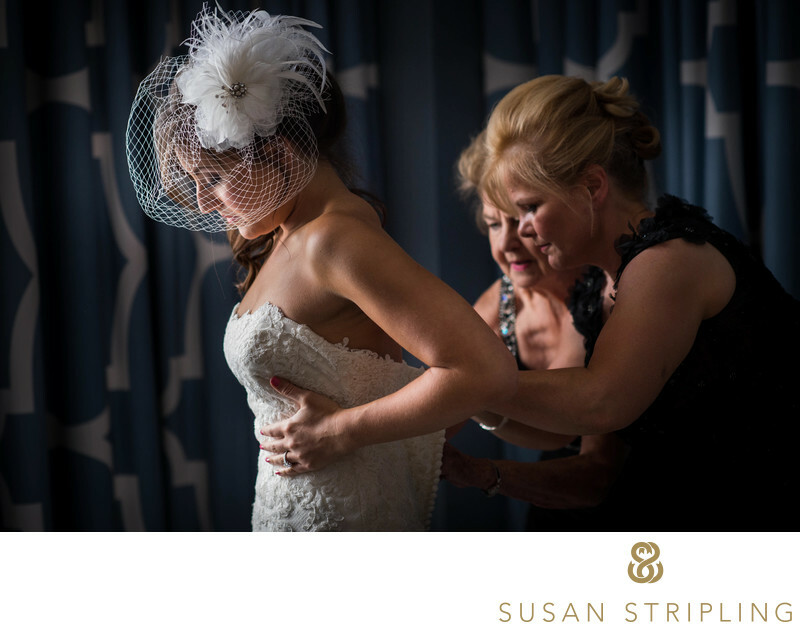 I have had clients get into their wedding dresses in their hotel rooms, their parents’ hotel rooms, or one of their bridal party members’ hotel rooms. This usually works out wonderfully, as those rooms are almost always much cleaner than a crowded conference space! If you still aren’t sure where you would like to get ready, please don’t hesitate to give me a call or drop me an email. I would love to talk to you about your plans, and help you make the decision that will work out the best for everyone involved! 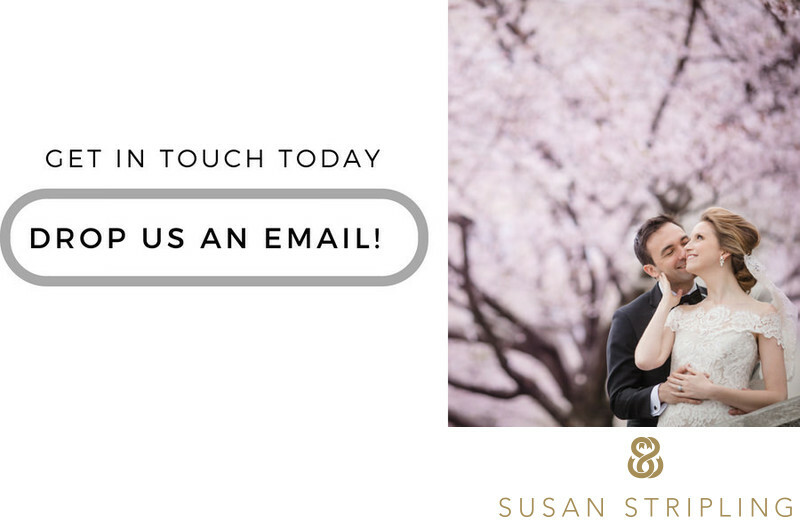 If you're getting married at the Hotel Monaco, drop me a note below! I'd love to hear more about your day! Location: 433 Chestnut St, Philadelphia, PA 19106. 1/160; f/1.4; ISO 125; 85.0 mm.